Kaleel Communique is an email series delivering ideas, information and strategies specifically for uncommonly successful people. The markets are unsettling lately, should you worry about retirement planning? You've had a lifetime of hard work, financial success and rewards. Your success has allowed you to do things you enjoy for yourself and your family and friends. You don't want that to change. Am I uncomfortable depending on the stock market returns to maintain my lifestyle when I retire? Will my assets allow me to replace the income I had during my working years? Would I like having a predictable guaranteed lifetime income to allow me to continue the rich and rewarding life that I desire? If you are close to retirement then you have probably done some planning. You need to replace the income you had while working once you retire. You have your pool of investments, most of which you can easily access. You may have other investments that are less liquid and may take time to become sources of income. The good news is you've amassed a lot of assets; however, stocks and other investments change in value. The bull market has gone on for a long time and it may continue. However, at some point, the tide will turn; a recession or an exogenous event can derail a bull market. When this happens, you will have less funds to draw on for income. In a down market, this can be risky. Think of your potential sources of income like a food pyramid where that bottom layer is your daily must have foods. In this case, it is your most secure income source, your foundation layer, with your pension and/or social security. Your additional layers are the assets you may draw down to support your lifestyle and legacy plans. The value of these layers is subject to all kinds of risks such as stock market volatility and interest rate risk. These assets will go up and down in value as conditions change. On the expense side, your expense pyramid has your essentials at its base. The next level is the fun, and the top level is the hopes for your family and legacy planning. Does your foundation income layer cover all your expense layers? Unlikely. Those upper layers of income sources and investments are subject to all kinds of risks. Drawing on those assets at the wrong time could derail your plans. 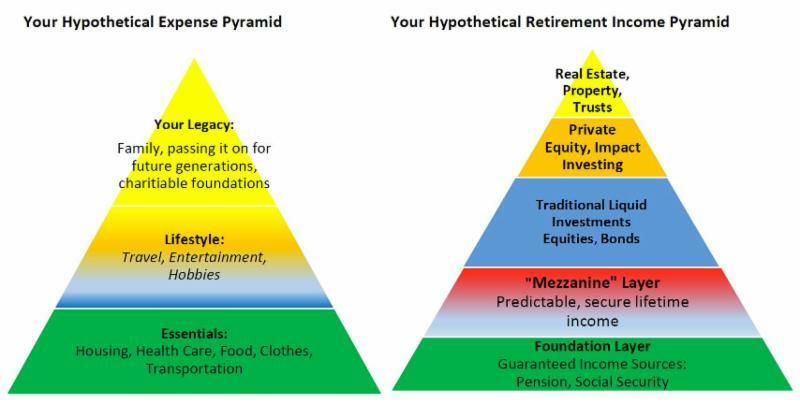 You can add a layer to your income pyramid that would not be affected by the volatility of the stock market or the challenge that bonds have maintaining value with rising interest rates. We call this layer the mezzanine. Reduces your dependence on stock market returns and reduce your overall risk in your portfolio to maintain your lifestyle. Produces a lifetime stream of predictable income. Allows you to invest your other assets for longer term growth for your legacy and family. The economy has been healthy and is entering the later stages of the current expansion that started in 2009. Eventually there will be a slowdown in growth and possibly a recession at some point. Unfortunately, we don't know when it will come. Therefore, there is no better time to think about secure income than in today's market! Come visit and see if this is a fit for you. Financial success today requires complex problem solving to manage the risks you see, and those you don't. Recognized in the financial industry as a leader and complex problem solver for uncommonly successful individuals, Michael Kaleel and his team of specialists use their intellectual capital to create sophisticated insurance and investment solutions. *This message is intended for the use of the addressee and may contain information that is privileged and confidential. If you have received this message in error, please erase all copies. *Investments offered through representatives of Lincoln Financial Securities, Member SIPC. Michael M. Kaleel, Branch Manager. *Advisor services offered through representatives of Kaleel Investment Advisors, LLC. Michael M. Kaleel, Registered Investment Advisor. *The Kaleel Company, Inc. & Kaleel Investment Advisors, LLC. and Lincoln Financial Securities are not affiliated. The fear of an all-out trade war gripped Wall Street last week, driving stock prices down to near calendar year lows. With just 4 trading days remaining in the first quarter 2018 (the markets are closed this next Friday), the S&P 500 is down 2.8% YTD (total return). A negative quarter would break the index's streak of 9 straight positive quarters and would be just its 2nd down quarter in the last 5 years. The S&P 500 has had 20 trading days YTD that have resulted in at least a 1% gain or loss, more than double the 9 such trading days that the index experienced in all of 2017 (source: BTN Research). Ironically, by the time the contentious steel and aluminum tariffs became effective last Friday (3/23/18), 32 additional countries had been added to the exception list from the original 2 exempted nations – Canada and Mexico. All 28 European Union (EU) countries plus Argentina, Australia, Brazil and South Korea, received last minute suspensions from the 25% steel and the 10% aluminum tariffs. Further exemptions are expected over the next 5 weeks (source: White House). Clearly the tariff situation is looking much less draconian. The US government came within 11 hours of its 3rd government shutdown this year, but ultimately Congress and the White House agreed on federal spending levels for the fiscal year which will be half over later this week. Legislation signed by President Trump funds the federal government through 9/30/18 and allowed both parties to claim victory – Republicans increased military spending by $66 billion over its 2017 level and Democrats added $52 billion to domestic programs. Apparently, “Fiscal discipline” is simply not a popular concept held by many current Washington lawmakers (source: BTN Research). HALF OF ONE PERCENT - The Federal Reserve began a rate-tightening cycle on 12/16/15. In the 27 months since then (through Friday 3/23/18), the yield on the 10-year Treasury note has increased 0.52 percentage points from 2.30% to 2.82% (source: Treasury Department). ENERGY INDEPENDENCE? - American oil producers have pumped at least 10 million barrels a day of crude oil for the last 7 weeks, hitting 10.407 million barrels per day for the week ending Friday 3/16/18. The last time US oil producers hit 10 million barrels a day of crude oil was in 1970 (source: EIA). ONE MONTH - The US government ran a $215 billion budget deficit in February 2018. Until 1986, the government had not recorded an annual deficit as high as $215 billion (source: Treasury Department). DEMOGRAPHIC SHIFT - By the year 2035, the projected number of Americans seniors aged 65 and up (78.0 million) will exceed the number of American children under the age of 18 (76.4 million), the first time in US history that will have occurred (source: Census Bureau). I hope you found this email helpful and informative. Reproduction Prohibited without Express Permission. Copyright © 2018 Michael A. Higley. All rights reserved. The content of this material was provided to you by Lincoln Financial Securities Corporation for its representatives and their clients. Securities offered through Lincoln Financial Securities Corporation, (Member SIPC) a broker-dealer. Past performance isn't indicative of future performance. An index is unmanaged, and one cannot invest directly in an index. This e-mail may include forward-looking statements that are subject to certain risks and uncertainties. Actual results, performance, or achievements may differ materially from those expressed or implied. The market's recent volatility has surprised many investors and has created headline news. While the sudden onset of volatility is unsettling, it's certainly not unexpected. To help allay your concerns, we'd like to share our perspective on the reasons for the recent market volatility. Global equities turned in a greater than 20% return in 2017. The momentum carried over into 2018 with a continuation of the advance. Then February brought a quick and powerful reversal. In just a few days, the impressive gains of January were largely erased, essentially leaving markets where they began. After the market close on February 5th, media outlets called the decline the “biggest drop” in history. While this may be true of intraday trading on a point drop in the DJIA, it isn't particularly helpful in assessing the decline. When viewed on a percentage change basis, the story is considerably different. It was far from the biggest drop ever: on August 24, 2015 the market fell intraday 6.6%, and in May of 2010, it dropped a staggering 9%. As time and markets advanced, those days are now largely forgotten. To state it more accurately, the February 5th decline was the largest drop in 30 months, and only the 99th largest drop in the last 120 years. This is not to say that we are dismissive or unconcerned about the decline. As an advisor and steward of capital, we are concerned about anything that affects our clients, their portfolios, and their goals. This situation continues to develop and the short-term direction of markets remains unclear. A case in point: On February 6th, equity markets oscillated wildly between losses and gains throughout the day, and ultimately ended up 567 points. Rest assured, we will continue to monitor the market with an eye toward prudent management of your capital. While the equity markets have enjoyed several years of low volatility, market downturns are not uncommon over time. It is important to note that the market tends to move in a “two steps forward, one step back” fashion. Source: Capital Research and Management Company Past performance is no guarantee of future results. Until recently, volatility in the markets had been uncharacteristically muted. As unsettling as it is, this may merely be a return to a more normal market environment. Over the past two years, the markets marched steadily forward. Importantly, through January 2018, the S&P 500 advanced 15 straight months on a total return basis. It is a typical human trait to become less accustomed to events when they become less frequent. The recent declines in the markets become more painful to many because they seem less common. These perceptions, however, don't alter the fact that periodic declines are both common and unavoidable. We focus on what is happening in the economic environment rather than the daily price changes of the indices or individual companies. The current environment continues to be on good economic ground. The news outlets will want to keep you engaged and tuned in to their stations by stating this was the “largest drop” or the “fastest decline” since whenever. These statements can get many people agitated; however, the worst possible reason to make changes is the emotional reason. We realize that market declines are unnerving to even the most disciplined investor. A great quote on what to do in times of market corrections comes from John Bogle founder of the Vanguard funds. When faced with a serious market sell off he said, “Don't do something, just stand there." This is sound advice on how not to react from a great investment expert. Please don't hesitate to call with answer any questions or concerns.